How to Choose a Rug that is PERFECT for Your Room and Budget! 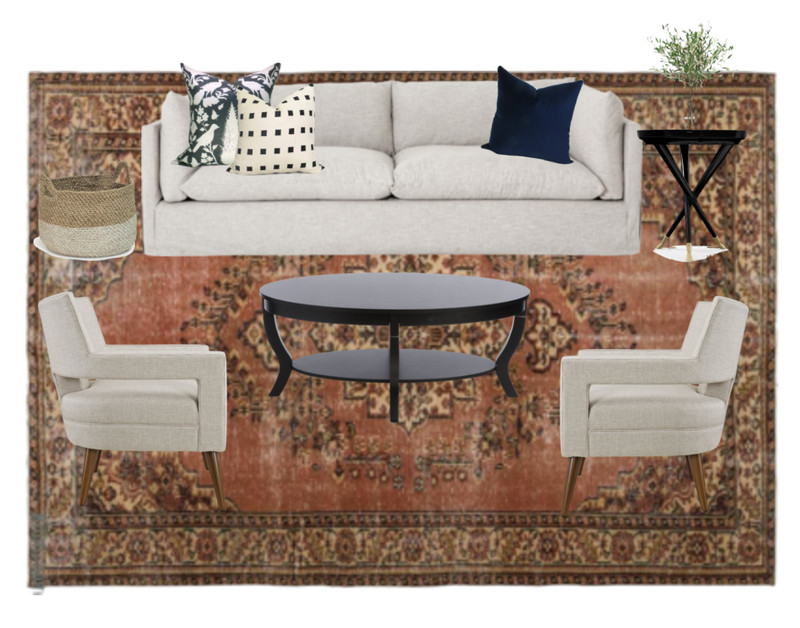 Need a rug, but don’t know what to buy for your specific space? Here are some guidelines for how to choose a rug for your room! Let’s talk about rugs. 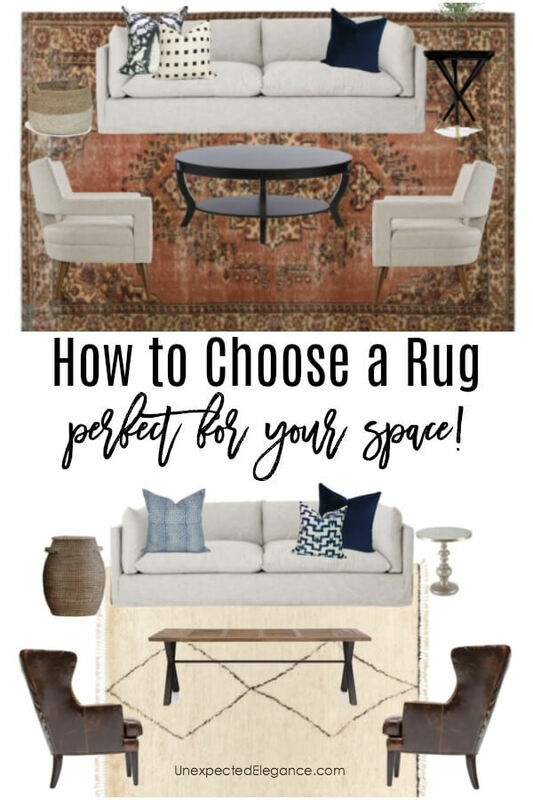 They can be confusing, so I want to help you choose a rug that is perfect for your space and budget! If you have a hard flooring (wood, tile, laminate…) you are going to want to add a rug to your design. They not only pull a room together, but they help with sound in the space. What if you already have carpet in a room? YES, you can still use a rug! You might want to use a rug if you can’t afford to replace the carpet or you want to define an area. 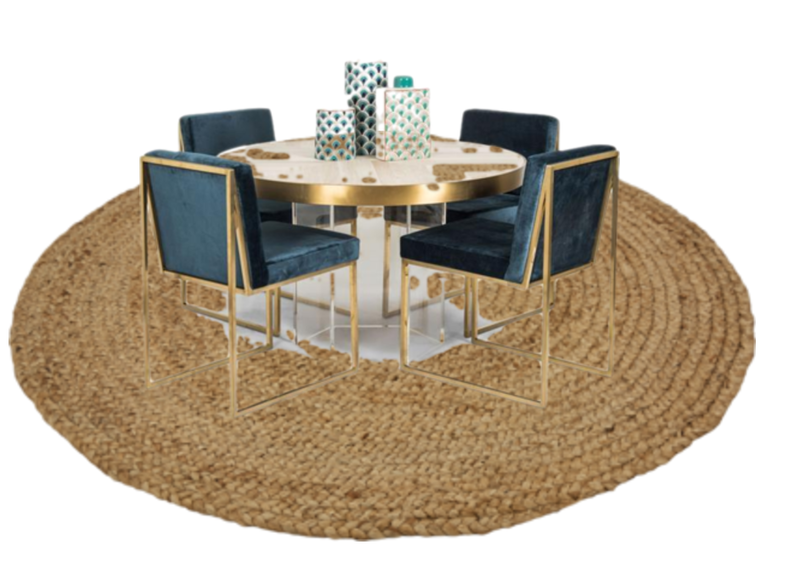 There are a million rug options out there, and I can’t possibly help you decide on just one unless we talk one-on-one, so let me help you decide on the size. 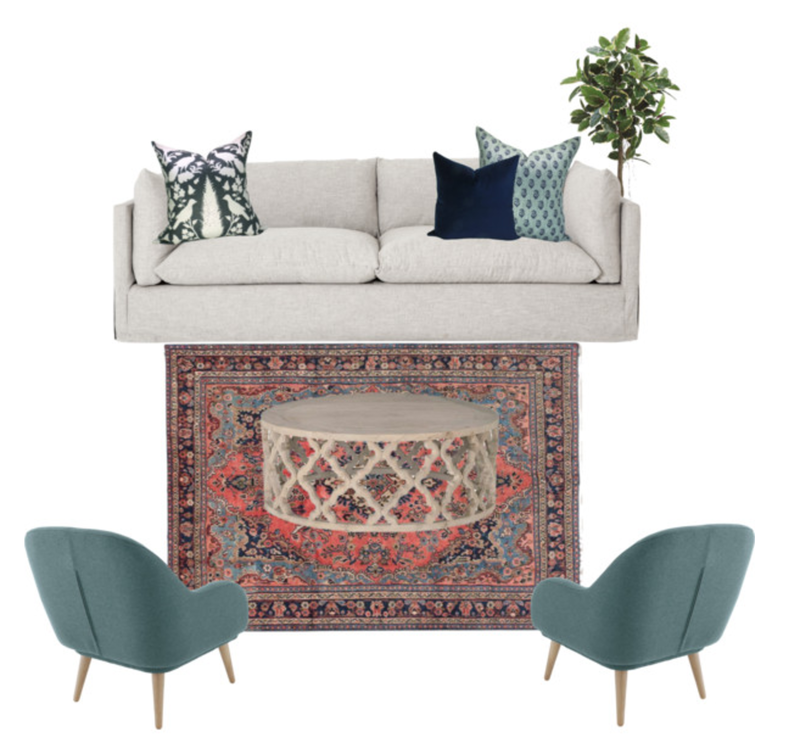 In an ideal world, all your furniture would fit on your rug. Realistically, this solution can get very pricey very quickly. As an alternative, make sure that at least the front legs of your furniture sit comfortably on the rug. Don’t be afraid to push your furniture closer together either; not everything should be backed against a wall. A few inches makes all the difference between the rug, pulling the room together or chopping it up. Opting for the larger option, especially if you’re between sizes, will prove worth the extra expense every time. Your room shape, not just the furniture, should dictate the rug size and orientation to make the space look larger and feel connected. If you choose a layout with the sofa on the rug, it should extend at least 12 inches on each side for proper scale. This layout is the best choice for anchoring a room, especially within an open-concept space. 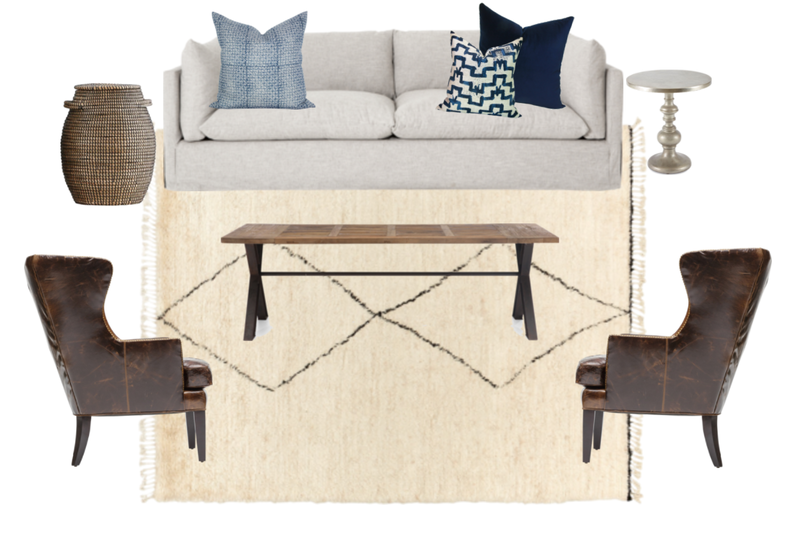 Placing all the furniture on the rug will unify the pieces and create a defined seating area. Try to leave at least 12-18” of viewable floor area if you can. This option is pretty versatile and works really well when one edge of the furniture grouping is against a wall. (You don’t need to pay for a rug to cover a spot no one sees!) However, consistency is key for a cohesive look, so the rug should be sized to allow for front-legs only across all pieces. If you have a small space, you might need to go with this configuration.This option is also perfect for narrow spaces because it plays off the room’s scale to make it feel larger. To get the proportion right, base the rug size on the interior dimensions of your seating area—and not just the coffee table—so it fills the negative space created by your furniture grouping. 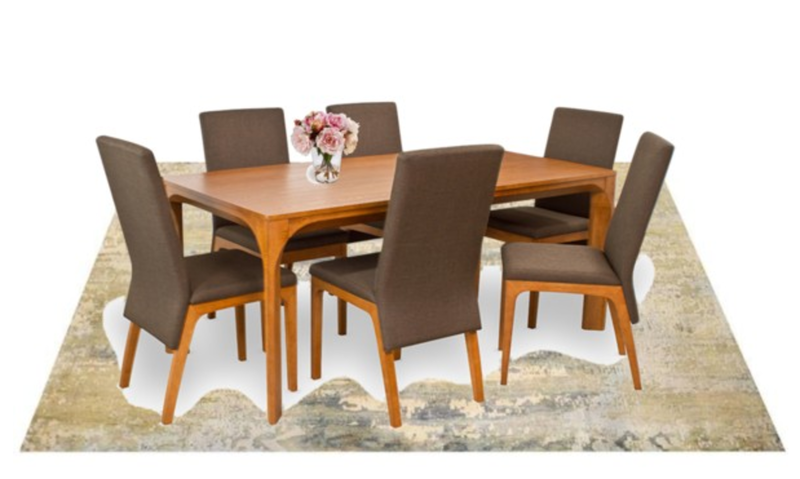 What size rug should I get for my Dining Room? Stick with all legs on the rug for this room. It should extend about 36 inches beyond all sides of the table (no less than 24), so chairs can sit on a flat surface, even when pushed back. Don’t forget to account for extendable leaves, if your table has them. 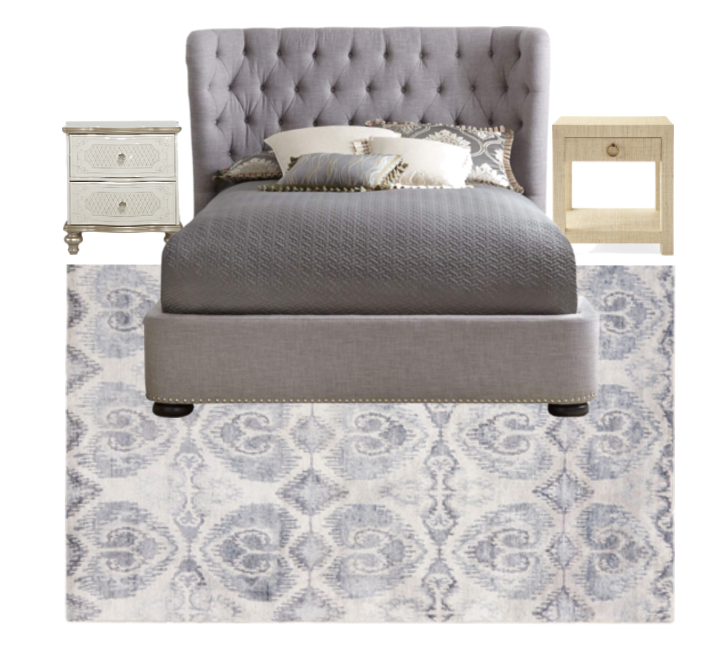 As the focal point of the room, your bed should also be the base for rug placement. Not only will this further define the space, but it will also give your feet a soft spot to land each morning. This layout extends beyond the bed to its accompanying furniture, like nightstands or a bench—but does not include bedroom pieces along other walls, like dressers. As a rule of thumb, leave about 18-24 inches of floor space around the rug, but don’t extend into any main walkways. This is the most popular option. It doesn’t quite extend up to your nightstands but still allows for 18-24 inches of room on the sides and past the foot of the bed. This choice is the most versatile and works for spaces and beds of all sizes. It’s also the best option if two sides of the bed sit against a wall. 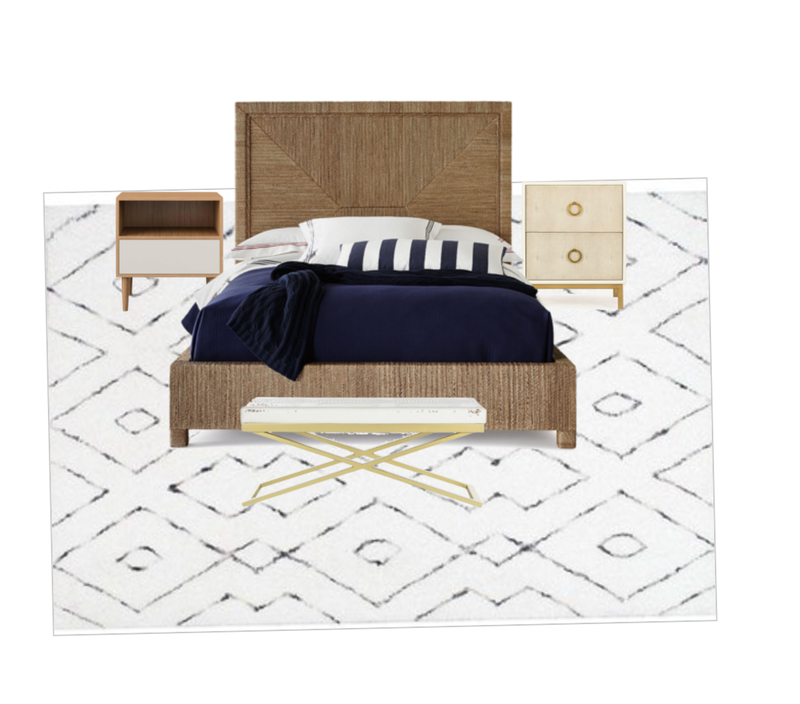 Scale matters for this look: The runner shouldn’t extend beyond the bed itself, but should be a bit wider than your nightstand. Runners are almost always a good choice for halls. It’s best not to clutter these narrow walkthroughs, so leave all furniture legs off the rug in this space. Make sure you add a no-slip pad under these rugs, to keep them from becoming a trip hazard! Let the shape of the space dictate the choice of round, rectangular, or runner, and use the width of your front door as a baseline. Check the pile height to make sure your door will clear the rug when it’s opened. TRICK: Use painter’s tape to mock the rug placement before you purchase and install. (Rugs can be heavy, awkward, and LARGE.). This secret is an easy way to check that you have the right fit from every vantage point, without breaking your back. If you’ve found this helpful, I’d love for you to take my FREE Design a Room in 5 Days Challenge! Learn more by clicking on the image below. What are the sizes of area rugs? Thank you! Fantastic resource; just what I was needing.